So often I had heard about the magical sandy beaches of Elafonissos island. 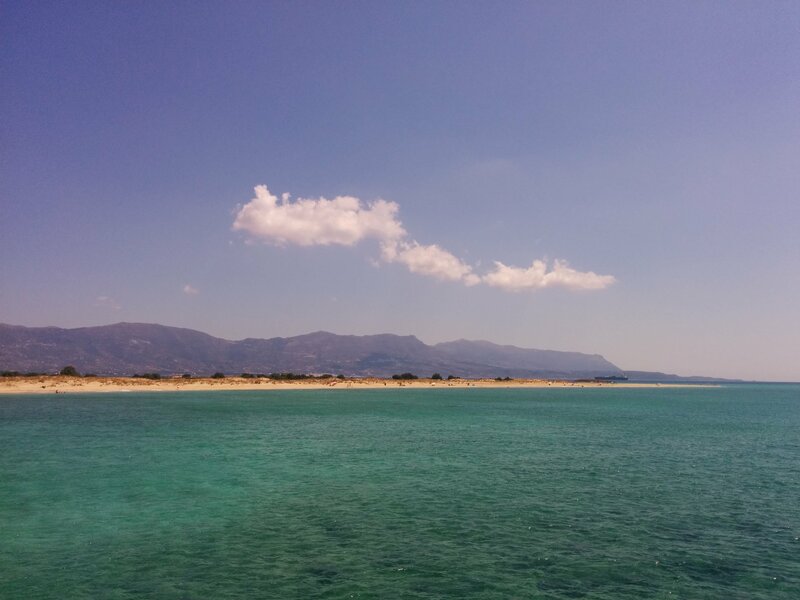 Last year we had the chance to make a family road trip through part of the Peloponnese and to visit this magnificent place famed for its sandy coast. Elafonissos has amazing tropical beaches and is very suitable for families with young kids. Here is my story! 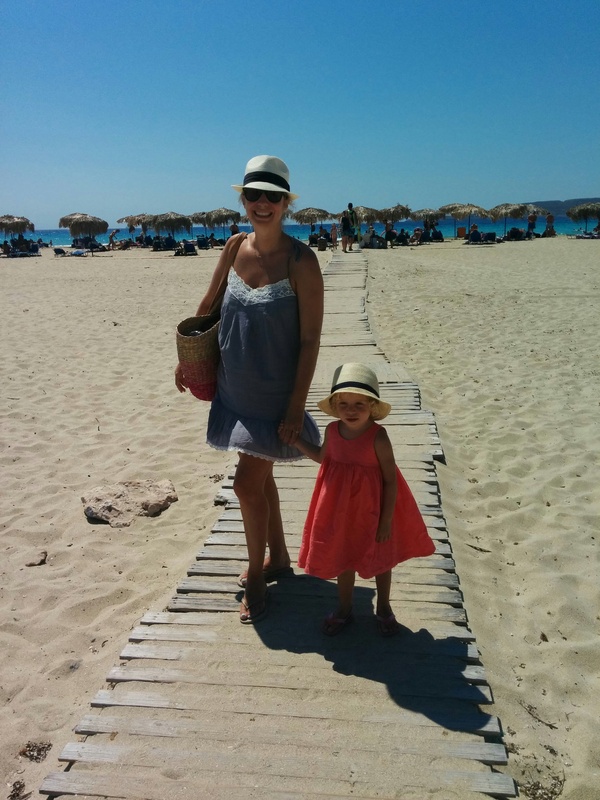 Elafonissos island with kids will be a relaxing holiday. Because Elafonissos island is very small, just 19 square kilometers, on the Southern Eastern tip of the Peloponnese. The distance from the mainland is only 570 meters! 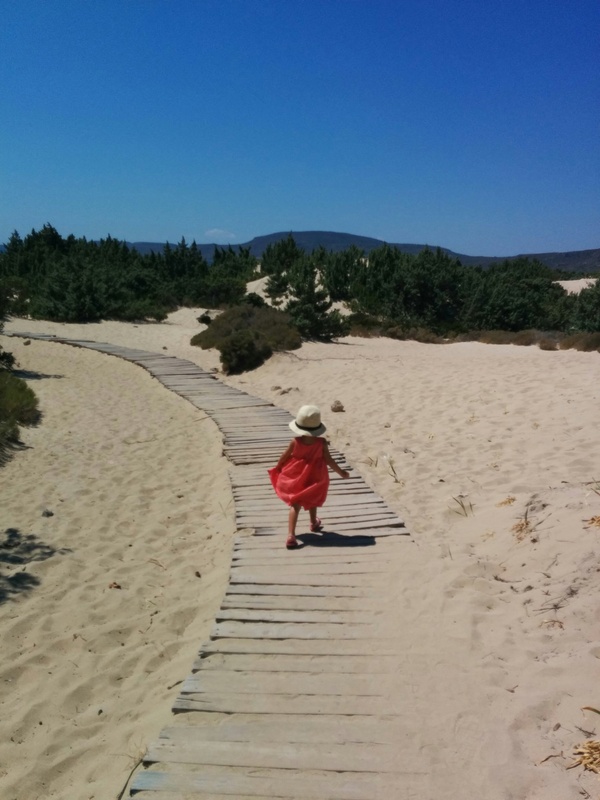 In recent years I have been avoiding islands that involve long ferry boat trips with the children and I have only been visiting the ones near Athens. The hassle of Piraeus port, the on – anoffloadingng of the cars on the big ferry boats, the travel time and everything else was not very child friendly to me. 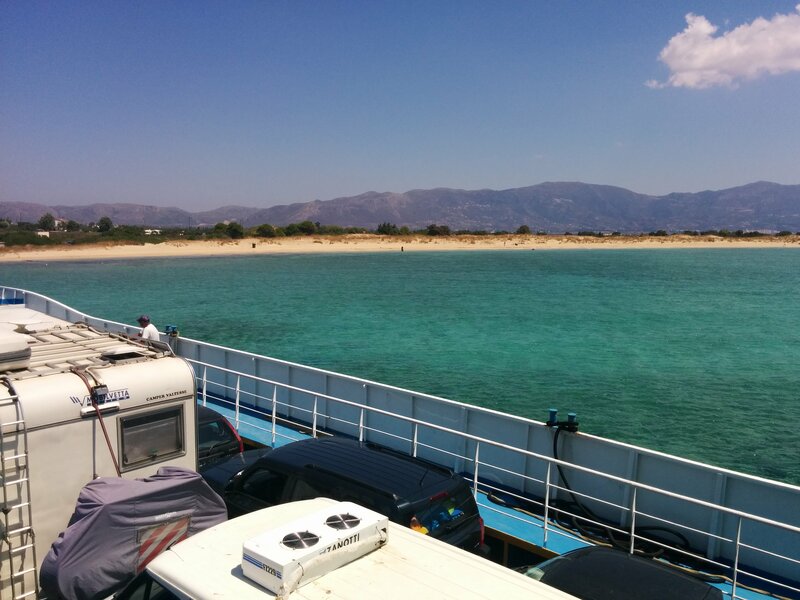 But the journey to Elafonissos was different: the ferry boat (there are two of them and to continually go back and forth to the island) was small and it was easy to get on and off with the car. The price of the ferry boat tickets was 12 Euro in total (4 persons including a large car!) and the journey acros takes only 10 minutes. And what a journey it was! Turquoise water, white beaches, clear blue sky. The island was connected with the mainland in ancient times and the sandy isthmus in between Elafonissos and the Peloponnese is very shallow. That is why the water has an amazing turquoise color. Not only the ferry boat trip was family friendly. 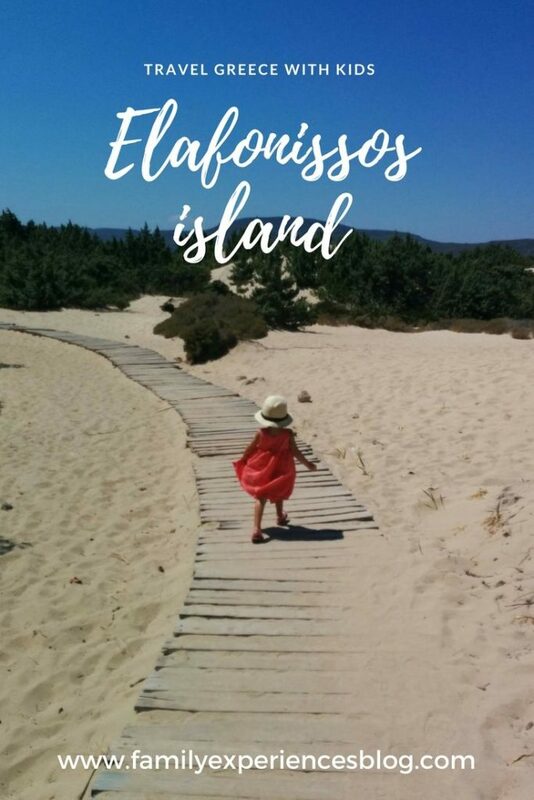 Due to it’s size, Elafonissos is great for families with young children: the distances on the island are small. 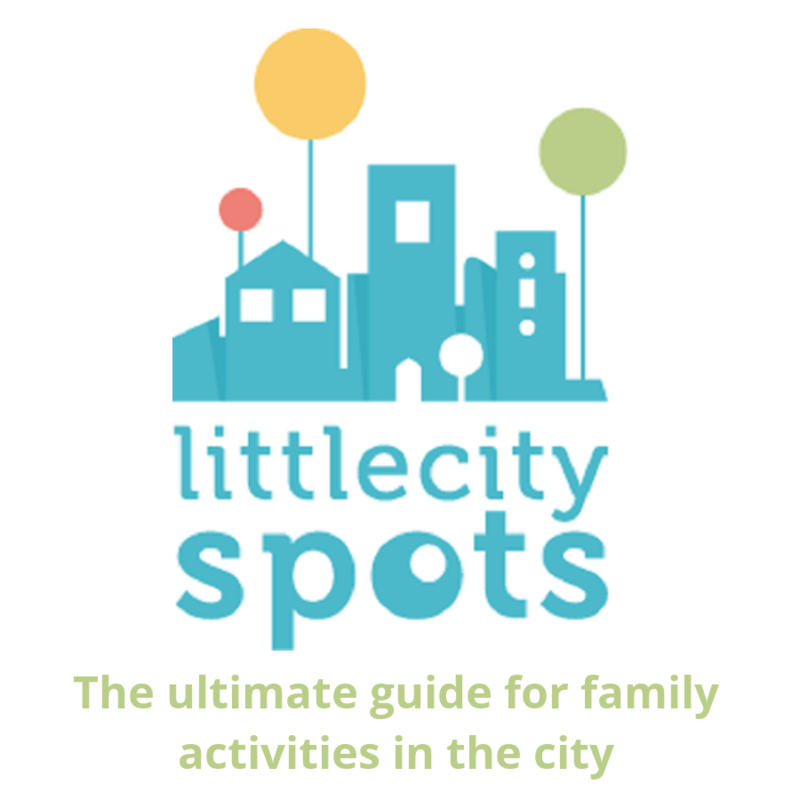 The port, village, shops and beaches are all nearby. The roads to the beaches are safe to drive and it is easy to find your way around, the sandy beaches have shallow seas and the island overall attracts the more relaxed crowd. All the beaches on Elafonissos island have a tropical look. 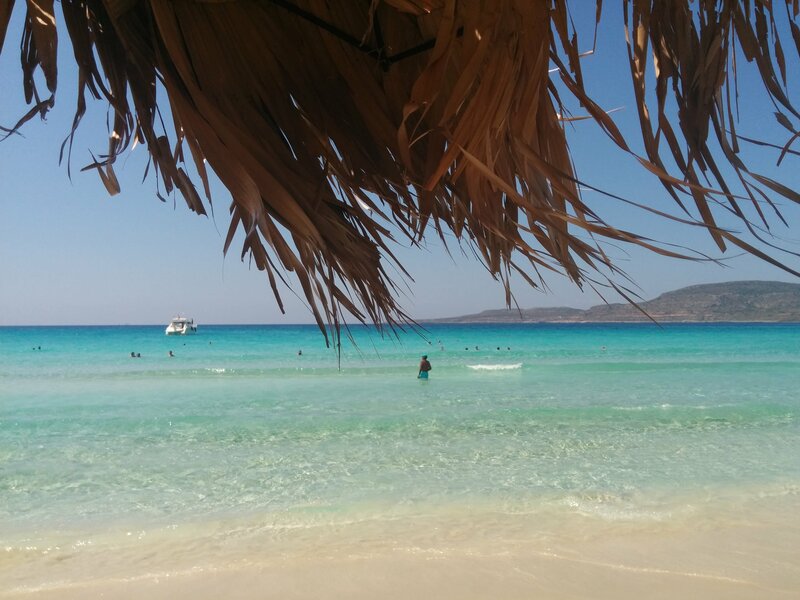 The two most famous beaches are Simos beach and Kato Nissi beach. They are considered one of the best beaches in Greece. They have soft fine with sand and turquoise clear water changing colors depending of the time of the day. 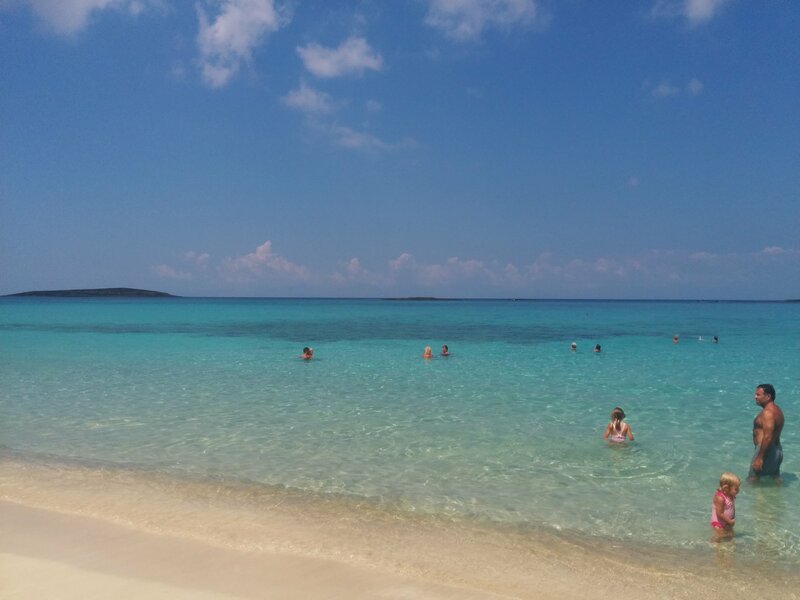 Both beaches are absolutely perfect for children because of it’s very fine and clean sand, it’s shallow clear water and the lack of loud and busy beach bars. There are beach chairs and umbrella’s on both beaches but there are no showers and no bathroom facilities. At some parts of these stretched-out beaches are lifeguards during the summer months. Simos beach (pictured above) is located on the south side of the island, a 10 minutes drive from the port. There is plenty of parking space between the sand dunes (here below) and the cedar trees. We choose the part called Paradise beach. To reach the actual beach, we had to walk a long trail through the sand, impossible for strollers and it may prove a bit difficult for the little ones in the summer heat. We paid 8 Euro for 2 stretchers and a large umbrella. There was some personnel delivering drinks and snacks from the nearby beach bar. In the afternoon the sea at Simos beach got pretty wild. The children loved to play in the waves. 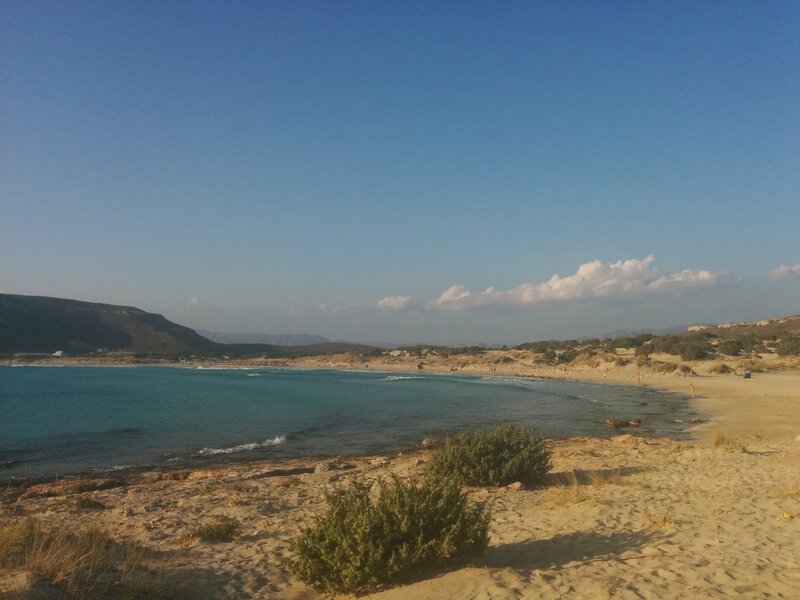 The second famous beach on Elafonissos island, the beach at Kato Nisi, was easier to access as it had a parking right next to the beach. Locals told me that the sea is always calm here, there are no waves. Although Elafonissos is small, there are plenty of taverns, cafes and ice cream shops – all located in the port or village that is also called Elafonissos. The area is closed for cars in the evening and we were able to make long strolls down the little shops and restaurants. Many children were riding their bicycles at the car free zone at night. There is a little church – the church of Agion Spyridon- it is build on a tiny island and connected with a narrow bridge to the village. The children loved the ducks in the port and there was a small playground. I liked the many taverns with their tables on the beach. While we were still eating – with our feet in the sand – the children were playing next to us. Elafonissos island has a large fishing fleet and there is plenty of fresh fish available on the island. We ate at the tavern ‘O Ntagiantas’, famous for it’s fresh seafood with saganaki shrimps, fish soup and lobster spaghetti. The fish and lobster were on display right in front of our tables and being prepared on a grill outside. We also ate at : ‘Gyrofolia’, a grill and souvlaki restaurant. Their tables are on the beach of Elafonissi port and their menu is small but delicious. I am not a fan of souvlaki shops and I don’t like the sight of the gyros meat out in the open. But this place was something else. I don’t think I have ever seen a cleaner and more appealing souvlaki place in Greece before. Leaving Elafonissos was as easy as arriving. Although we left the island on one of the busiest Sunday’s of August, there were no waiting lines. The ferry boat came right away and within 15 minutes we were back at the mainland and on our way to our next destination. Elafonissos island is a very family friendly island! We did not make a booking in advance in Elafonissos island. We arrived on the island without a plan and without a reservation in the middle of August. It was difficult to find something available until we heard off Kato Nisi self catering family apartments. We arrived late at night. Tired and in need of a good sleep. The next day I woke up from a good and quiet sleep in a traditional wooden hand-carved bed. I drank my coffee outside at the sitting area in front of the apartment. There I met the same kind lady from the previous evening, she offered us some home made cake to eat for breakfast and introduced her family. These were the owners of the apartments, Mrs. Athanassia Tsegka, her husband, her 2 two daughters and their 2 year old grandson. 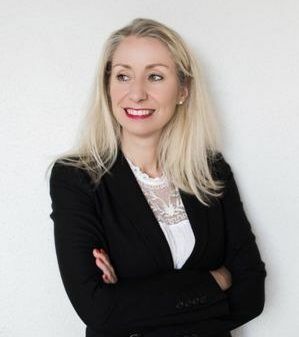 Before I had told Mrs. Athanassia about my blog and my continuous search for family friendly places in Greece, she had already explained her philosophy to me: “See our apartments as your family summer home, they are basic, clean and family orientated, think of them like your country house’”. And this is exactly how I felt here. My daughters made instantly friends with the other children on the grounds and were safely playing outside whilst I prepared our bags for the beach. The plain but clean Kato Nisi apartments are situated near the Panagitsa area and on a 5 minutes drive away from the village and port. Simos beach is 10 minutes away. 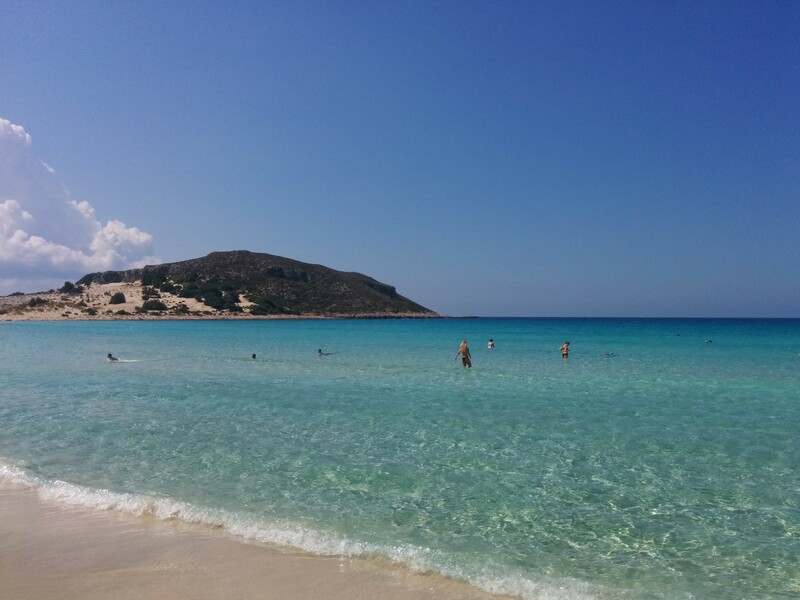 The famous beach of Kato Nisi is 5 minutes away by foot. We walked this road with our children. There is not much traffic but there is no sidewalk. There are 3 apartments: 2 quadruple and 1 triple. The quadruple rooms have a fireplace as well. As I mentioned before, we actually stayed in the triple room with 4 people. If you are a family of 3 + and baby (baby cots are available), even the triple room is large enough for one or two days. The rooms consist of 2 sleeping rooms – connected via a sturdy door so privacy guaranteed – a small but fully equipped kitchen, a bathroom and plenty of storage space. The rooms have 2 entrance doors; one in the front via the garden, and one in the back. I find this ideal. When my kids were asleep in the one bedroom, I could still enter from the other side of the house without disturbing. There is a small sitting area in the front of the apartment, but the secret is in the back: a private outdoor shower at every apartment!! Other amazing details: all rooms and doors have mosquito nets with locks. This means that you can leave your door/window open when you sleep at night, or let your child have a nap, drink your wine outside and not worry about safety. The rooms also contain traditional island elements and all furniture is hand made by the Greek Vateli house. We were provided with plenty of towels, extra sheets, and pillows. The garden of Kato Nisi apartments is full of exotic cactuses, plants and flowers, figs and basil. There is a big table that can be used by everyone to eat or to play games (games are provided by the family too). There are also children chairs and toys. The garden is safe; the gates are always closed and the staircases are guarded with safety doors. On the rooftop is a large communal veranda with tables, lounge chairs and space for the children to play. It has sea view and is the perfect place to drink your coffee in the morning or have a drink in the evening whilst your children are asleep in the rooms below. There is also a mini market on the grounds. Not only do they have the very essentials for families: diapers, wet wipes, milk and other children-necessities, they also sell fresh bread, fresh pies, their own produced olive oil, marmalade, and other local products with very good prices. 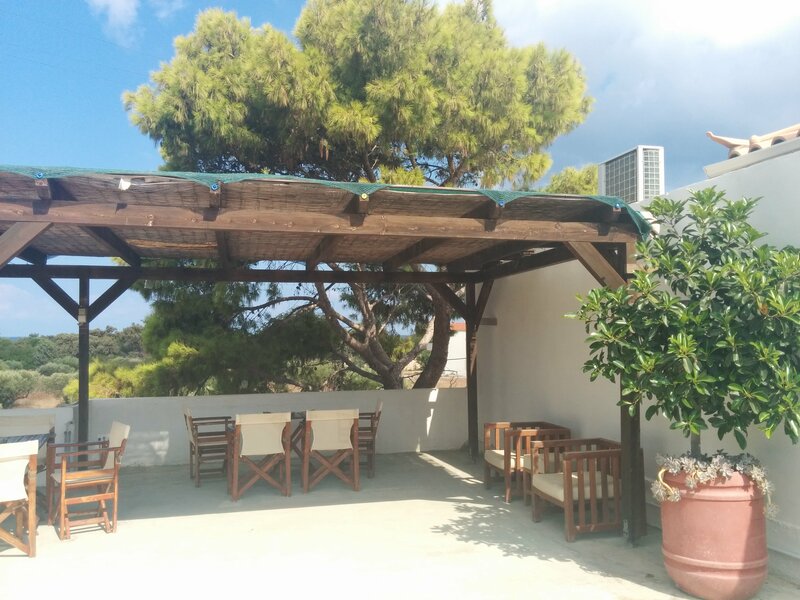 The surroundings of the apartment: olive gardens, eucalyptus – and pine trees, the beach and the mountains. There is a private parking across from the apartments. Kato Nisis apartments are basic self- catering family run apartments operated in the true family atmosphere! Mrs. Athanassia told me that she is always present and whatever her guests need, she will try to arrange for it. This accommodation is not a luxury hotel but we had a very nice experience nevertheless. I was a paying guest at Kato Nisi apartments – all views and experiences are my own.